Welcome back guys (happy Friday! ), today I am looking at the top picks of long-sleeve wedding dresses on the high-street for under £250! Budget wedding dresses are the theme of this weeks post so be sure to check out the other wedding dresses I have featured this week. psst... get your hands on my freebie whilst you are here too... my 'Wedding Planning Checklist' will arrive right in your inbox, want your copy, just click HERE! 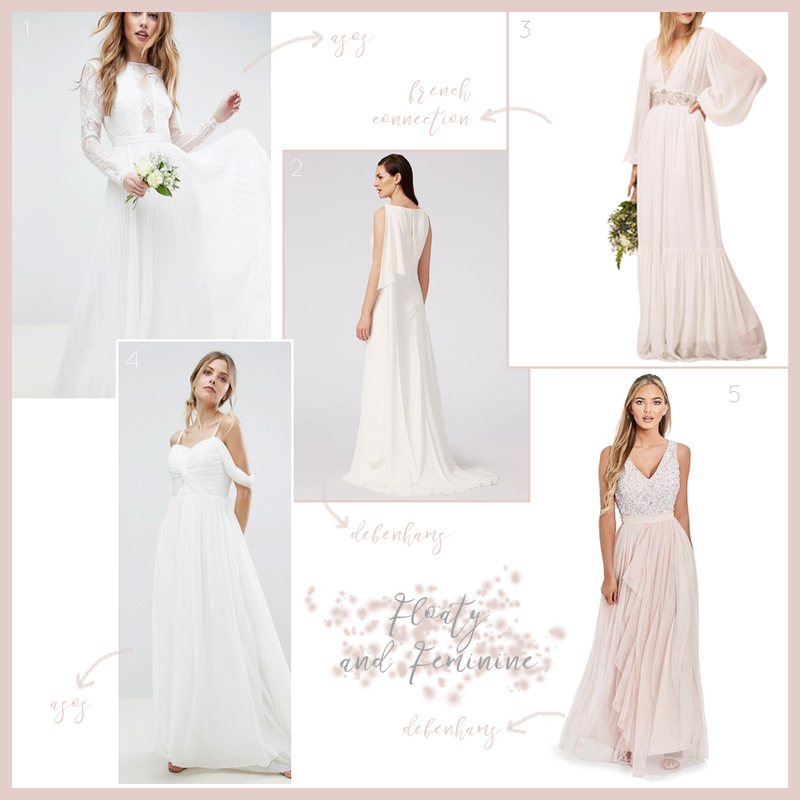 I think that this particular selection of wedding dresses are my absolute favourite; I guess they are just a bit more 'up my street', so much so that I struggle to pick my 'number one' from the bunch! The first dress is so very pretty and has such a gorgeous 'v' shaped back to it too, I love it! It is the 'Rosaline' maxi dress and is available from Debenhams for under £100! It is a very similar shape to my dress in that it comes in at the waist/just above the waist (height dependent of course!) and flows out beautifully down to the floor, which worked nicely for hiding my tummy! If budget is a mega issue for you then I think you may like this one. Dress two is another Debenhams dress, the 'Eleanor', and is very similar to the first but has the added details of lace overlay and a few more special details. Because of the added details you obvious will find the price to be a little higher, but at £220 I think this is a stunning dress for the money; it's so pretty and elegant don't you think? This next dress (no: 3) is the lowest priced dress of the entire series. At just £64, this gorgeous Vero Moda (at ASOS) dress has a full lace detail and a dip hem, I love the simplicity of the shape of this dress and for the price I think it really is wonderful. Dress four is yet another Debenhams wedding piece (honestly, their dresses are so beautiful guys); this dress is called 'Joy' and is an ivory v-neck, highly embellished wedding dress. It is stunning and, in my humble opinion would look wonderful at a Christmas wedding but equally is good at any other of course! The very last dress (no: 5) is slightly more unusual but I thought it was super cute! It is from ASOS and priced at £150. These dresses are great if you want to show off a little of your beautiful body but still maintain some dignity! What do you think? That is it for this weeks budget wedding dress series! There really are some fab dresses on the high-street and, quite honestly, if you can push the budget up by a little more then £250 then you have so many more to choose from. Have a good look and order things you wouldn't normally think would suit you, trust me, you will often be surprised by what a dress actually looks like on you and may find something much prettier and more suited to you then what you thought your dream dress would be! Please leave me a comment and give this blog series a like on here too, I would love to here from you! I will be doing more on the budget wedding theme soon, so make sure you add Leaf Lane Studio to your favourites and follow me on Instagram! How are we on day four of my Wedding Dresses on a Budget series already! If you haven't seen the others be sure to check them out! Don't forget that I am offering all of you gorgeous brides to be a FREE Wedding Planning Checklist too, all you need to do to grab your freebie, straight to your inbox, is click right HERE! Let's continue right on with our gorgeous high-street wedding dresses for under £250; today I have selected some of the prettiest figure-hugging dresses for you. These dresses are guaranteed to show off your beautiful body and hug you in all the right places, let's go! If you have an hour-glass figure then dress number one will flatter you in every way! This dress is by Sistaglam at Debenhams and comes in at £175 which seems a small price to pay for such pretty details don't you think?! The 'Olga' (dress 2) is an elegant, ivory dress from Monsoon and is right on our budget at £249. If classic is what you are after then stop right here and get yourself over to Monsoons website immediately! I adore the simplicity of this wedding dress and think it look stunning on all you slender beauties out there. Dress three is a definite head turner isn't it? It is from Debenhams and costs just £120 (!) and has a sweet fish-tail detail (and looks like it would cost a fortune!). Create a feminine silhouette to really 'wow' with this dress (I'm super jealous of you ladies that can get to wear something like this, it's so glamorous!). My favourite of todays picks is dress number four; it has such intricate detail with its lace and sequins and I think it would look so pretty at a summer wedding. This beautiful dress is by Adrianna Papell for John Lewis and costs £240 but I think you will agree that it is worth it. Finally, something for you more bohemiam beauties! Dress five, by ASOS, is a pretty bandeau maxi-dress, with stunning floral lace and drop shoulder sleeves. At £150 I would say this is supr affordable too, what do you think of this one? I feel another flower crown coming on! Thank you for checking out todays post! 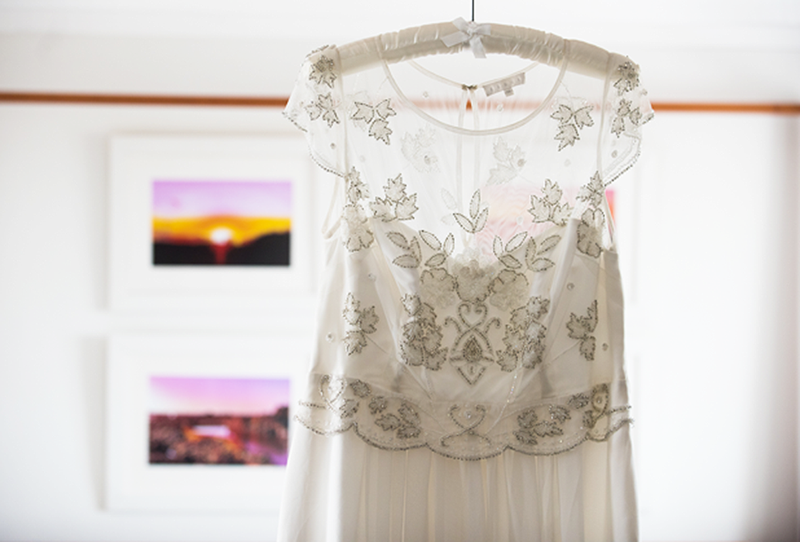 Come back tomorrow for the final installment of the wedding dresses on a budget series. *All prices listed and links I have provided were correct as of the day of posting! My first pick of the midi's (no:1) is this long-sleeved, lacy number from ASOS. It costs £180 and I honestly think it is worth every penny. It has the most gorgeous lace detail overlay and is such a pretty option if you want traditional looking bridal without the length. When I saw dress two on ASOS (curve range) I had to select it as it is super cute! When I was looking for a dress I struggled a lot with sizing (I was a size 16 then) and I didn't even think to look for a range for more curvier ladies. This dress is £140 and I think it is so flattering for our curves, I really do. The top has a gorgeous overlay which looks stunning on larger-chests and places the emphasis on the narrow part of the body - the waist, perfect! What do you think? Dress three is so much more simple in style, but holds its own on the glamour front with its beautiful sequin detail! It is from Monsoon (their Bellona dress) and is near the top end of our budget, at £229, but certainly a classically style and all those sequins make it suitable for a more glitzy wedding for sure! I adore dress number four; it is so pretty and like a typical princess dress! You can get this dress from the wonder that is ASOS (don't they just do everything?!) and it is a mere £200! I reckon that is a good price to pay to feel like a princess, don't you? Despite looking like it may cost a fortune, dress number five, the 'Samantha' v-neck, from Debenhams, costs only £105, what a bargain! I mean, how elegant is this dress? I think it would suit so many brides, from the more mature lady through to someone who wants something simple with little detail. That is all for today lovelies! Be sure to comment on which one is your favourite and share this post with your friends for their opinion too! Don't forget that you can get your hands on my FREE Wedding Planning Checklist right here (it will pop right into your inbox!). Yesterday I posted blog one of five all about budget wedding dresses available on the high-street (if you didn't see yesterdays post, which was 'Floaty & Feminine' then click on through!). I am bringing you my top picks of the dresses you can order on-line for less than £250; trust me, you can find a very pretty, dream dress for a low budget, I did it and I still adore my dress. Today I am showing you my favourite sleeveless wedding dresses and I honestly love them all! With so many out there to choose from I think it is very important to not limit your mindset to the usual bride insecurities of 'but if I go sleeveless my arms will be on show' (because it really is nonsense beautiful lady! ), after all, there is always the option of buying a pretty shrug to wear over the top if you fancy. Before I go onto the dresses let me remind you about my free 'Wedding Planning Checklist' you can get straight to your inbox, super handy if you are in the midst of planning your magical day. To get your checklist, just click right here - enjoy your planning and, don't forget, I am here to answer any stationery related questions you may have too, just get in touch with me on hello@leaflanestudio.com! If you are looking for something classic and pretty then you can't go wrong with dress one, the 'Elaine' from Debenhams comes in at just £139.30 and looks so elegant. I love the high neck line with delicate lace to hide your modesty yet maintain the element of detail; so gorgeous! Dress two is the 'Jarlo' from ASOS and really stood out to me as something a little different. At just £115 it would suit most budgets and would slot right in at a destination wedding and keep you nice and cool; if lace is your thing then I think you'll love this dress. At £150 this beautiful Debenhams dress (3) (by Dorothy Perkins) would suit any bride looking for something simple and fuss-free, it's elegant shape would flatter so many of you gorgeous ladies and, if you need more details then why not add a more extravagant bouquet or even a flower crown? Dress four is my personal favourite of this bunch! It is from ASOS and is a steal at only £95! This stunning dress is so feminine and has delicate pearl details on the top half and falls to a floaty skirt; perfect for the extra girly bride to be! Lastly we have dress five, the cheapest of the bunch I picked for you, not that you can tell! This dress comes in at a bank-loving £84 and can be found on ASOS. Once again, I think this would look beautiful worn at a summer wedding; it has gorgeous lace detail on the bodice and falls to a maxi dress length, making it leg-lengthening and elegant! That is it for todays pick from the high-street; I hope you are enjoying this blog series so far. Tomorrow I will be back with more dresses for your wedding on a budget but, in the mean time, I would love you to leave me a comment letting me know which of todays is your favourite! See you tomorrow! So, you're planning your wedding day (congratulations!) but if budget is key you may be thinking about how you are going to afford your dream dress. Most brides-to-be know what they want and also know that what they want can be crippling on their overall wedding day budget, but never fear, I have a five day blog series focused purely on purse-friendly wedding dresses that you can get on the British high-street, all for under £250! What I ended up with was something super floaty and girly, which was not originally what I planned to have, so trust me when I say this: order a whole range of styles as you may be surprised what ends up being your dream dress (more styles and shapes coming every day this week so stay tuned!). *All prices are as shown on day of posting this piece and everything is linked below the image to help you head right to the one you love! Dress number one is from ASOS and is just £120. This dress is my favourite of today's selection as I think it's so pretty but also offers us girlies some of the things we may be looking for. Its pretty lace sleeve details give that little bit of coverage but look so feminine too, and the slightly more fitted lace bodice really flatters any curves, which we should all be proud to show off! I adore this dress, what do you think? The second dress (2) is by Ben-De-Lisi, via Debenhams, and is currently priced at £209.30. I chose this for today's selection as it is a more simple dress and very classic and elegant. Head over to the website to see the front view; I wanted to showcase the back as it is very pretty! If you are hoping for something a bit more bohemian then dress three, from French Connection at John Lewis may be right up your street! It is available on-line for £250 and has some gorgeous details and a slight 70's vibe to it. This is the sort of dress I can see having a floral crown for company! Dress four, from Y.A.S at ASOS is only £120 and I think it is wonderfully romantic and super pretty. The drop shoulder style is perfect for a location wedding and would look gorgeous on so many brides. If you are looking for something for a summer wedding but feel a little self-conscious of your upper arms area (not that you should at all because you are gorgeous!) then this may be something to consider, as the draped shoulders lead the eyes further down the arms, towards your lovely waist and create a beautiful, feminine look. I'm not big on sequins personally but when I saw this dress, I must admit I fell instantly in love with it! Dress five, which is from Sistaglam at Debenhams, for just £145, has a stunning sequin bodice and layered, floaty skirt which looks simply beautiful in the dusty pink shade, what do you guys think? I honestly love this dress and wish I could buy it to, you know, wear around the house! There you have it for day one of my 'Wedding Dresses on a Budget' series. Coming tomorrow is my top picks from the high-street of sleeveless wedding dresses! I would love for you to come back tomorrow and, if you enjoyed todays post, please leave me a comment and hit the 'like' button too! I would love to hear from you! PS: If you are planning your wedding day and would love a FREE wedding planning checklist (plus free bonus printable all about wedding stationery) then all you need to do is click right here to get my super useful checklist sent straight to your inbox!